If you sing before breakfast you will cry before supper...’ In their own words, what it meant for Victorians to dream of actors, April Fools, herrings or a railway ticket – why it was advised to throw a black snail by its horns over the left shoulder for good luck – and why it is essential to inform bees of a death in the family. “If one drops a knife, a woman is coming; a fork, a man is coming; a spoon, a fool.” Tapings on tables, questionable curatives, old wives’ tales and whispers from beyond the grave–Victorians were fascinated by the supernatural. 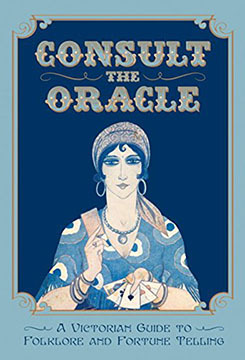 Consult the Oracle was where they might have turned when they needed to identify a witch, interpret an omen or dream, required a natural cure or wanted to divine their future with a pack of cards–or simply wished to understand what the supernatural meant to them and their ancestors. First published in 1899, it offered a layman’s guide to ‘matters magical and mysterious,’ and today is a quirky glimpse of a supernatural age now lost, by turns haunting and hilarious. Contents includes: The meaning of dreams; Omens, charms and spells for lovers; Mystery about plants; The fortunes of little people; Curing ailments by magical means; Fortunes told by cards’ Character shown in handwriting; Weddings and married life; Spiritualism; Feathered prophets of good and evil; The significance of names; Astrology; Palm reading; Fairy Folk; What about witches? ; Bees know more than people think; tons more. Imported from Britain. A strange and wonderful book! CONSULT THE ORACLE: A Victorian Guide to Folklore and Fortune Telling By Gabriel Nostradamus. 192 pages. 5x8 Hardback. Illustrated.